Vincent Perriard sits down with Haute Living Co-publisher and Haute Time curator Seth Semilof to introduce a timepiece that single-handedly defines innovation: the HYT H1. You have the indication of time, the hours, in the liquid system, [including] the minutes, the power reserve and the seconds. Haute Time, the ultimate resource for luxury timepiece aficionados, is flooded with new content from Basel World 2012. Undoubtedly one of the most exciting new posts on the site surrounds a groundbreaking creation: an interview with Vincent Perriard, co-creator of the spectacular HYT H1. Perriard and co-creator Bruno Moutarlier, former Industrial Director of Audemars Piguet, broke the mold with their first launch. 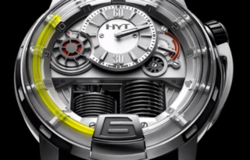 The HYT H1 is the first timepiece to perform on liquids; it features mechanical and liquid time indications. A liquid module functions with two pistons moving liquid in the tube, resulting in 65 hours of power reserve. HYT H1 was created in Black Titanium, Pink Gold and Black Gold in only 160 units worldwide. The revolutionary timepiece took Basel World by storm, and we expect that Perriard’s creation will do the same to the luxury watch industry in the years to come. Gaining an inside look at the industry’s star timepieces directly from the company CEOs demonstrates the respect and passion Haute Time reserves for luxury watches and their corresponding brands. Discover the HYT H1 from the whiz himself here http://www.hautetime.com/feature/haute-time-presents-vincent-perriard-of-hyt-watches-at-basel-world-2012 and explore the many wonders of Basel World 2012 at http://www.HauteTime.com.